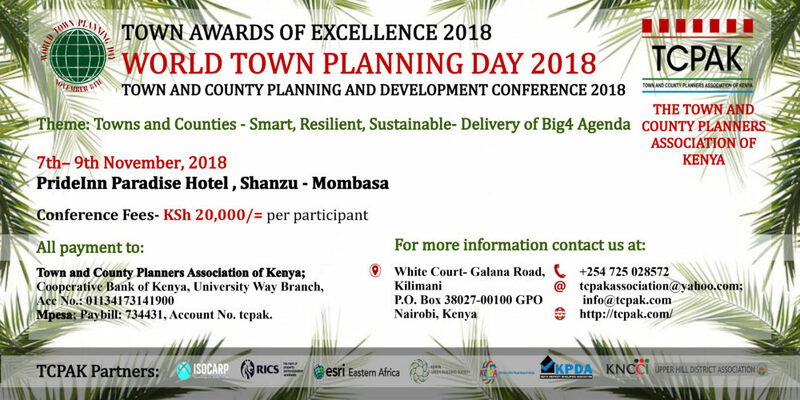 The Town and County Planners Association of Kenya (TCAPK) will be hosting the World Town Planning Day (WTPD) event, on November 8, 2018 in Mombasa, Kenya. This is a happy moment as it designates the 10th anniversary of TCAPK celebrating the WTPD. In addition, ISOCARP Africa Region/Nairobi Liaison Office will celebrate its 10th birthday on the same day. The WTPD event will also include the Town and County Planning and Development Conference and Town Awards of Excellence, held on November 7-9, 2018.